From Under the Bed – Viking Theatre – Review by Frank L.
The action takes place in Leitrim in 1979 in a farmhouse of little comfort. It is occupied by two brothers in their late sixties. Eugene (Seamus O’Rourke) is the elder of the two. As the play begins he is asleep in a very substantial iron bed. The room is sparsely furnished. There is a knock on the door and then another. Eventually, having received no response, Pat (Arthur Riordan) enters. Eugene wakes and the gritty relationship is immediately revealed as Eugene complains about Pat’s profligate use of the recently installed electricity. Eugene believes that only one light should be on at any time. Their existence has been one of dreary, manual repetition. There have been very few highlights but the Eucharistic Congress in 1932 was one for which Pat had a new suit. He still has it and he is wearing it as he enters the room. The Pope’s visit to Ireland in September 1979 reawakens that high point in his life. The highlights in their respective lives are remarkably few. But they are for each brother matters to which they have both given considerable thought as they now gradually reveal them. O’Rourke and Riordan are very well paired as the two elderly brothers and they have a fine rapport. It is easy to imagine they have lived together under one roof for a very long time. However, the arrival of electricity signifies change and upheaval in their domestic arrangements. They reveal, with considerable humour, to each other “secrets” in their respective lives and even decide to switch bedrooms so that in the second half it is Pat who occupies the large iron bed from where he gives a gentle rendition of “Do you want your Old Lobby washed down” and Eugene is not frightened to be critical of the Pope’s visit in some respects. The play is about handling change. Even if it is set in 1979, Ireland was then on the verge of change which has transformed it in the last thirty-nine years. With social media and the internet playing an increasing role in society and the United Kingdom about to leave the European Union seismic changes are once again afoot in Ireland. 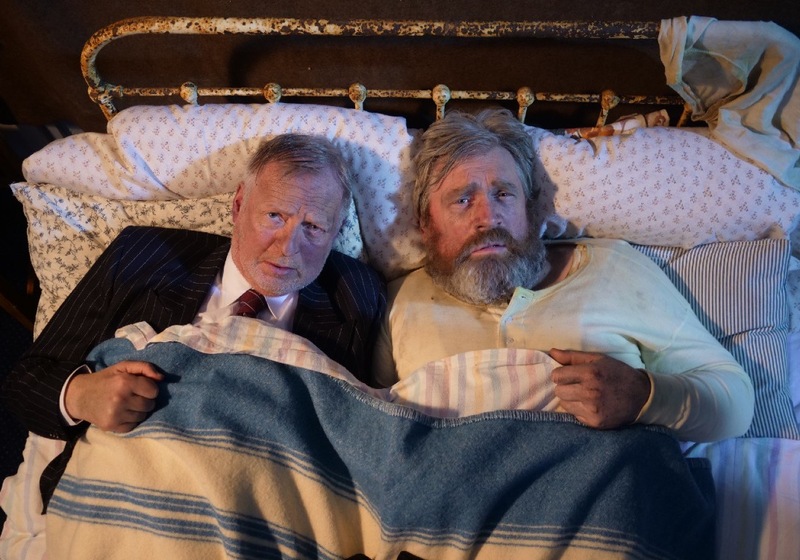 “From Under the Bed” shows in a quiet corner of Ireland how two elderly Irish men dealt with change almost forty years ago. It does so gently and generously. It is deservedly playing to full houses in the Viking theatre in Clontarf and will then go on tour to various locations throughout Ireland.